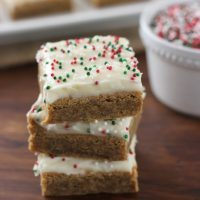 Soft and chewy, these Gingerbread Bars with Eggnog Cream Cheese Frosting are an easy recipe to have on hand for last minute holiday gatherings! Christmas is less than two weeks away! Are you ready? I’m not. And I’m becoming okay with that. 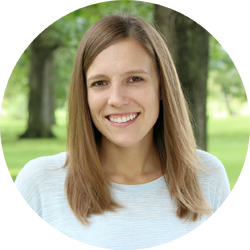 With all of the hours of driving to find a new home to rent, the packing, the actual moving, the unpacking, oh, and the sickness that just didn’t want to leave my husband and me, this holiday season has been somewhat hectic. So, instead of being stressed about what’s not done, I’m going to be happy with what has gotten done. There just may not be as many decorations hung, cookies made, and other traditions fulfilled. I’ll just slowly work my way through the absolute necessary and be happy with the extra things that I’m able to slip in among the necessary. 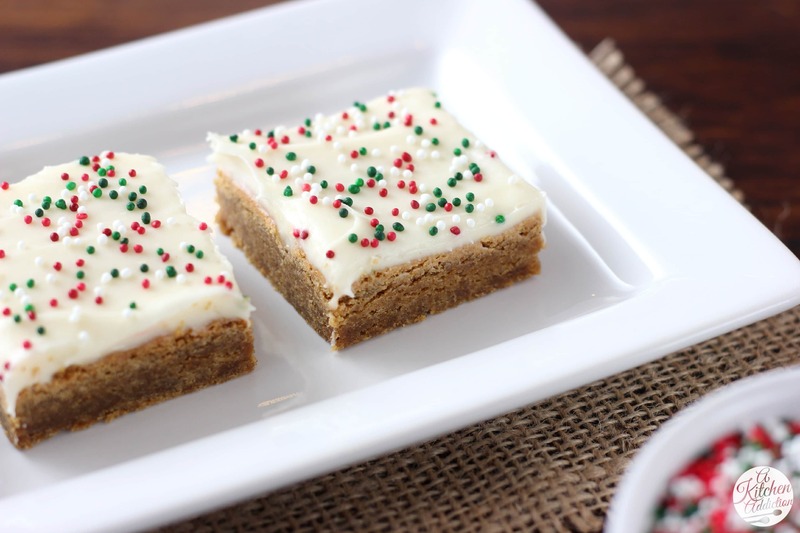 One of the extra things that I got done was a batch of these gingerbread bars with eggnog cream cheese frosting. They weren’t on the traditional list of what needed to be made, but I am sure glad that I took the time to make them. 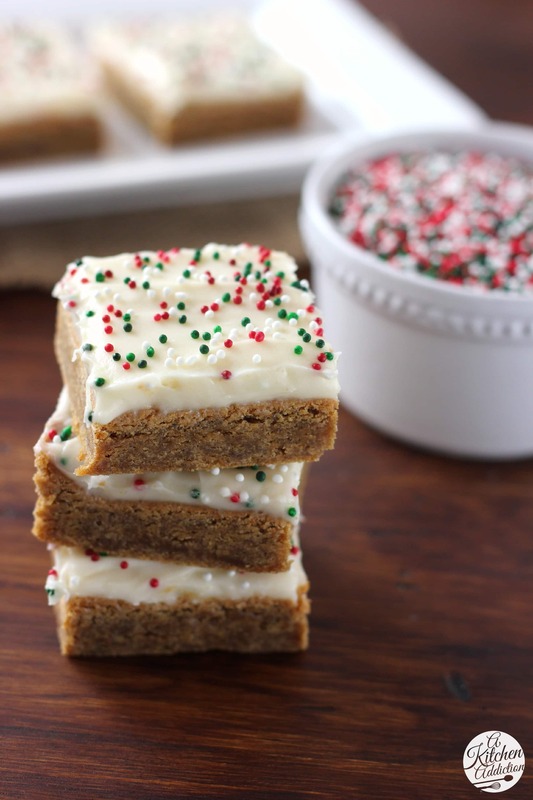 These gingerbread cookie bars are perfectly soft and chewy. 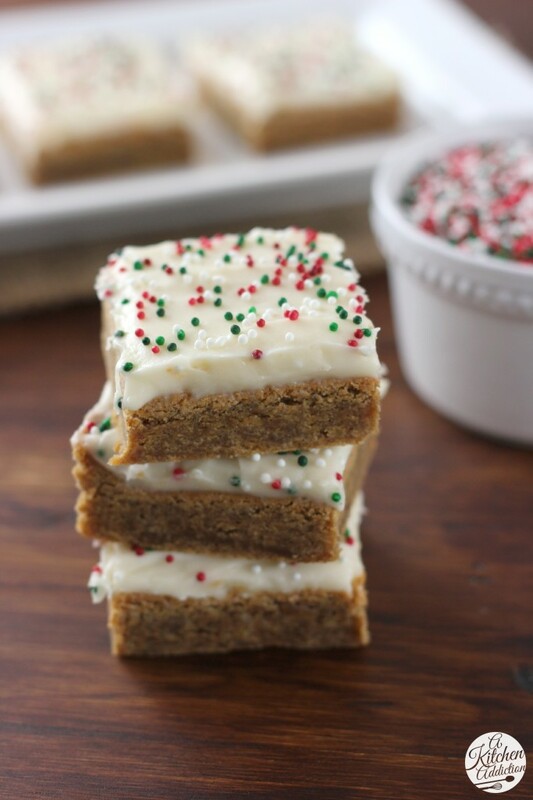 Since gingerbread bars aren’t complete without frosting, I settled on an eggnog cream cheese frosting for these bars. The spices of the eggnog give the frosting a subtle flavor that ties the flavor of the frosting with the flavor of the gingerbread. This recipe can easily be doubled and takes very little prep work before you can pop them in the oven. Perfect recipe to have on hand for last minute holiday gatherings, because making life less stressful is the theme of this holiday season! Preheat oven to 350. 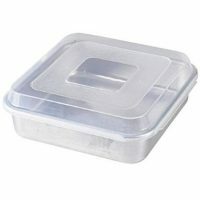 Lightly spray a 9x9 inch baking dish with non-stick cooking spray. In the bowl of stand mixer or with an electric mixer, cream together butter and sugars. Add in egg, vanilla, and molasses and beat until creamy. In a separate bowl, whisk together flour, baking soda, spices, and salt. Add dry ingredients to wet ingredients and beat until combined. Spread batter into prepared baking dish. Bake for 20-25 minutes or until edges just start to turn golden brown. Do not overbake. While bars are cooling, prepare frosting. Cream together cream cheese and butter until smooth. Add in powder sugar and eggnog. Beat until smooth. Spread frosting over cooled bars. Top with sprinkles. I’m completely in love with these! Gingerbread is one of my favorite winter flavors! Moving over Christmas?! That’s NUTS! Good thing you have these incr-EDIBLE bars to eat. But, I love how you’re focusing on what is done! Silver lining! Pinned! You just moved?!!! oh my goodness, you know what? don’t even worry about all the holiday fuss .. as long as your family is together and has some presents under the tree and something warm to eat, I’d say that would make for a wonderful Christmas!! And just give your family lots of these gingerbread bars. . yummmm!!! love these and hope you are feeling better! Happy holidays! Wow, it sounds like you’ve already had a busy few weeks and there is still more to come! I’m so glad that you shared these bars with us. I love the combination of the eggnog and gingerbread. Try to relax a little this weekend! You totally had me at gingerbread! I love this combination and they look so sofy and chewy! Oh man, I’m in serious danger of eating way too many of these. I love your attitude about just enjoying the holidays with what you have done. We all should do that more often! And that eggnog frosting…I seriously want to smother myself in it! Yum!!! I am totally not ready for Christmas! I mean, I kind of am, since I started baking and shopping in October…. but I know that between now and Christmas I’m going to have a baby, so it seems like a LOT has yet to happen! Lol. 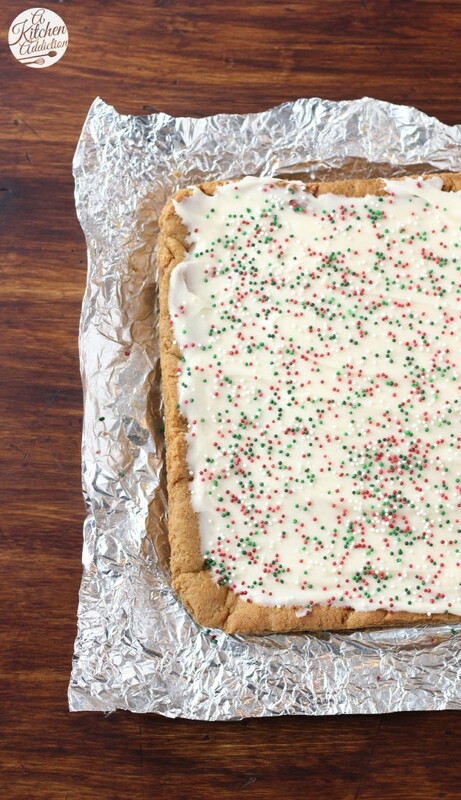 Love these soft chewy bars and that frosting is a perfect match for the gingerbread! Less than two weeks?? I’m all good 😉 And yes to just enjoying the holidays. Nobody really cares if you don’t have 15 different varieties of fudge out! Pinned! That frosting looks magical, I just want to grab a spoon and dive in! Delicious bars here! Ohhhh these look amazing! Love the flavor combo. I hope you recover fast and enjoy the holidays as much as you can with all that’s going on! I can’t decide which layer I like better but I guess I don’t have to choose. Yum! I can’t believe how quickly this time of year always flies by – the less stress and more gingerbread the better for me! These sound perfect. thos are festive and adorable and I am adding them to my holiday baking round up! These bars look delicious and are perfect for cookie exchange parties! Just finished these. They are delicious! I would recommend not baking past 20 minutes – they might not seem done (if you’re more accustomed to cakes than bars, like me), but they will be. Chewy, gingerbread goodness! I’m so glad you liked them! Thanks for letting me know! Do you know if I can double it for a 9*13 pan,? Sure, you can double it. The bars will be a little thicker, so it will probably take a few minutes longer for them to bake. Hope you like them! These look amazing! I will be bringing these to a party (40 ppl) on christmas eve…do the pans need to be lined with foil I was confused by the picture..just want to get this right! I’ve made them with just cooking spray and with aluminum foil and both ways work. I used aluminum foil for the ones in the picture, because I wanted to take all of the bars out as once. Sorry for the confusion! I hope you like them! Everyone loved them- what a great recipe that I’ll be using again next year, thank you for sharing! I’m so glad you liked them! They continually make an appearance at our house! Very good! I had to increase baking time to 30 mins. Thanks for sharing. yes that time of year again for cookies and saw this wonderful recipe and have to comment on how creative it is! Thank you for sharing this! These gingerbread bars were so amazing! I made them for a work party and they were absolutely a hit! The only change that I made to these bars was instead of doing the cream cheese frosting, I made a marshmallow buttercream and sprinkled it with a little cinnamon. I’ll definitely be making these again! Amazing recipe!! I’m so glad you liked the bars! Love the idea of using a marshmallow buttercream! You can freeze the bars before you frost them. The frosting will change texture slightly when frozen and thawed. Hope that helps! Is the butter in the bars and the butter in the frosting unsalted? You can use either salted or unsalted. These came out fantastic! my husband and I hosted a large crowd for a holiday party, and made these for dessert. The consistency on them was great. Would adding extra eggnog to frosting make the frosting too runny? I noticed several comments saying that they didn’t notice much eggnog flavor. I love eggnog and will make this delicious looking recipe. Thanks for sharing ???? I wouldn’t add too much more eggnog as it would making the frosting too runny to set up. You could try adding a bit of nutmeg and cinnamon to boost the eggnog flavor. Hope that helps! Do these need to be refrigerated? I just made them but not serving until tomorrow. Sorry for the delayed response, your comment ended up in a different folder somehow! I know it’s late, but the bars will be okay for a day or so if your house isn’t warm and humid. Made these for a cookie exchange with my baking club. They were a big hit! I love that they have the gingerbread taste but the texture of a bar. My husband, brother and father in-law are requesting more as well. This is a keeper and being added to my Christmas baking list. Thanks!